There's a lot to consider when it comes to upgrading your daily drives from behind the wheel of a new or pre-owned Subaru at our Subaru dealership in Indianapolis, IN. You need to find a model that is well suited to your personality and lifestyle, but you also need to find a financing plan that works within your budget. To that end, it can be difficult to decide if buying or leasing a Subaru is more beneficial. There are plenty of advantages to each, but we'll go through some of the differences to help you come to a decision. If you opt to lease a new or Certified Pre-Owned Subaru, your down payment will often be lower than if you choose to finance. If you love the Subaru you're leasing, you can always decide to buy it once the terms of your lease are up. If you'd like to upgrade to the newest Subaru within a few years, you can always do that at the end of your lease. This way you don't have to worry about ongoing maintenance or prolonged wear and tear; you can upgrade to a brand-new vehicle every few years. Your monthly payments will often be lower with a lease than if you chose to finance over the same period of time. The longer you drive your new or used Subaru, the more value you'll gain from it. Plus, owner equity can increase over time as well. After you drive off our lot you can feel free to customize your Subaru any which way you'd like. Change the color, install accessories or alter the interior -- you're free to do anything you please. The Subaru you purchase can serve you reliably for many years to come if you take care of it. You can drive freely with no mileage restrictions. Whether you have a long commute to work or want to enjoy some long road trips from behind the wheel of your Subaru, you'll never have to feel limited. If you'd like to learn more, our Subaru financing team is happy to sit down with you and go over the benefits of both leasing and buying a new Subaru. They'll look at your financial situation and make recommendations that work for you. 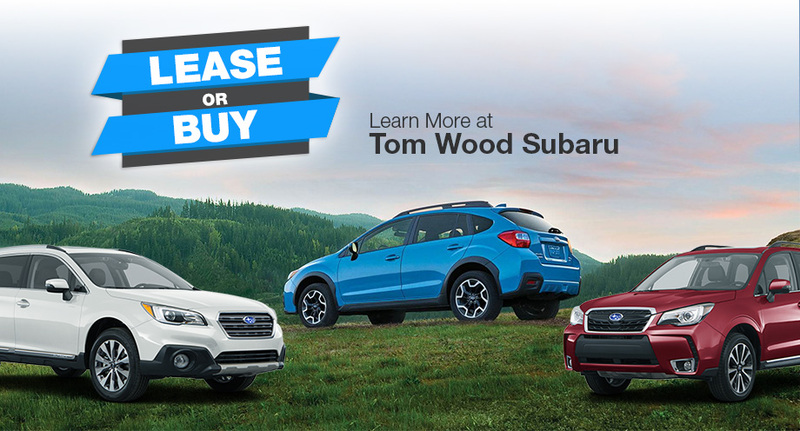 Visit us at Tom Wood Subaru today!